Last weekend my husband and I had the privilege to take part in the celebration of a lifetime. Truly, it was beyond anything I had ever attended. There was thoughtful attention to detail from the transformational setting, to the superb entertainment (4 bands! ), to the fabulous food offerings and the superior service. I felt like I was on the show Lifestyles of the Rich and Famous (I just showed my age, didn’t I?)! However, one detail really stands out as the diamond in the rough: we had to check our phones at the door. Yep, really! And it made for a completely delightful eventing! We all could access our phones for messages at the coat station, but once in the party atmosphere, we were completely unplugged. Without even realizing, we were all so much more invested in the moment and those around us. We actually had verbal conversations. We danced and ate and didn’t worry about what was happening everywhere else in the world. There was no football, babysitters, political ads, Twitter or Facebook for a few hours – and it was so enjoyable and memorable! Everyone stays so constantly connected, we forget that we can retreat. We are all so plugged into the world and feel the need to be completely accessible at all times, that we forget that life is happening before our eyes and to really capitalize on the life you have, you have to be in the moment. I once heard someone comment on a beautiful view during vacation and say how they can’t wait to come back here. What is wrong with the view in that moment? Life throws you curveballs and you may never get back that moment or feeling, so be in it. 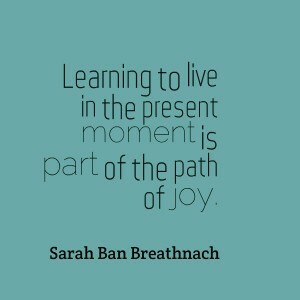 Be in that exact moment and relish it! We certainly capitalized on our party invite and feel all the luckier for it!